These versatile Lippage Leveling System Spacers fit both DTA and other cap systems on the market! Constructed from sturdy plastic, the DTA Universal Lippage Spacers feature a curved base that enables leveling of uneven tile and hollow spaces in the base ensuring proper thinset bonding around and through the base. As part of the DTA Lippage Leveling System, the system provides contractors and amateurs alike with the ability to correct uneven tile when completing an installation. The DTA Universal Lippage Spacers are designed to be used with both DTA and most other non-DTA caps on the market. The extra-long straps can be used with tile up to 2.8” (70mm) in both floor and wall applications. 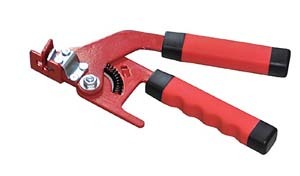 These lippage spacers are a great way to cut the headache that comes with uneven tile during an installation. The DTA Universal Lippage Spacers are part of the innovative DTA Thin Tile Lippage Leveling System. This system is well-crafted and designed specifically to eliminate tile lippage when installing the currently popular style of large format, very thin tile. 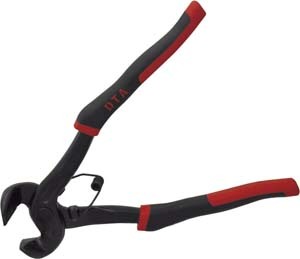 It consists of DTA Caps, Universal Spacers and a DTA Lippage Leveling Gun in one convenient package. The DTA Lippage Leveling System ensures that individual pieces of tile will lay flush with each other during installation. 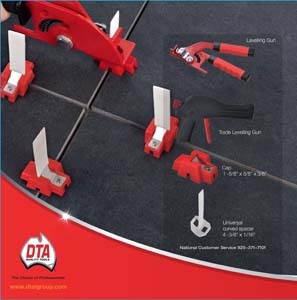 The DTA Lippage Leveling System features sturdy plastic spacer and cap components that hold the tile in place using a gear lock strap mechanism until the thinset hardens. 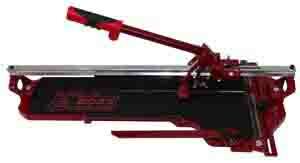 A floor tile leveling system is necessary for any tile installation project big or small. The system is a great way to ensure that your final project meets your rigorous standards. It is a practical and easy way to eliminate lippage and differences tile elevation. Lippage is both an unsightly issue and a dangerous one that should not be present in any of your installations. Adding a tile leveling system to your process may slow the job upon first use; however, the finished product is well worth the slight bit of extra effort. Everyone wants a quality finished product free from uneven spots and an appearance that is below standards. Whether this is your first time completing a tile installation or it’s your 1000th, everyone can benefit from using a tile leveling system to ensure your floor passes spec. A tile floor that is lippage-free with no ridges or valleys is the goal of all flooring installations regardless of skill level. When a set of tiles is laid end to end across the floor or walls of a house, they really enhance the beauty. But sometimes, due to natural shrinkage or curving of the tiles, there is a difference in elevation between adjacent tiles. This is called lippage, and sometimes the cause is as simple as poor workmanship too. We at Tile Pro Depot believe that a DTA lippage leveling system is very important is today’s construction. There is a growing trend towards larger and larger tiles, due to which it is difficult to maintain the same level at all ends of the tile. Such uneven faces of tiles not only look unsightly, but they might also pose a safety hazard. A good DTA lippage levelling system can ensure that whatever the size of the tiles used, they are perfectly levelled and stay that way. This is necessary even if the process seems a little time taking at first. We bring you a versatile and effective DTA lippage leveling system that is easy to master for amateurs, and meets the exacting standards demanded by experienced professionals. This comes to you in a nifty package consisting of DTA Caps, Universal Spacers, and a DTA lippage leveling gun. The Caps and the lippage spacers are made of sturdy plastic, which is lightweight nonetheless. Made of sturdy plastic, our DTA caps helps to hold the extra-long strap in place, while you use the gun to press the two adjacent tiles down to the same level. This ensures that the thinset below the tiles is equally applied throughout the underside of the tiles. Our DTA lippage levelling system can also work with non-DTA caps. 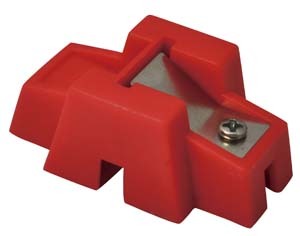 Our lippage spacers can be used in both small as well as large tiling systems. 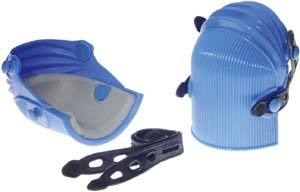 It is a T shaped piece of sturdy plastic whose ‘legs’ are inserted below the two adjacent tile with the top of the spacer sticking out, so that it can be worked on by the cap and the gun. Once the lippage spacers have been inserted, the caps are placed on the vertical stub of the spacer that sticks out. The gun helps tighten the gear lock mechanism and pushed down the tiles uniformly, till both the adjacent tiles are placed uniformly on the thinset.